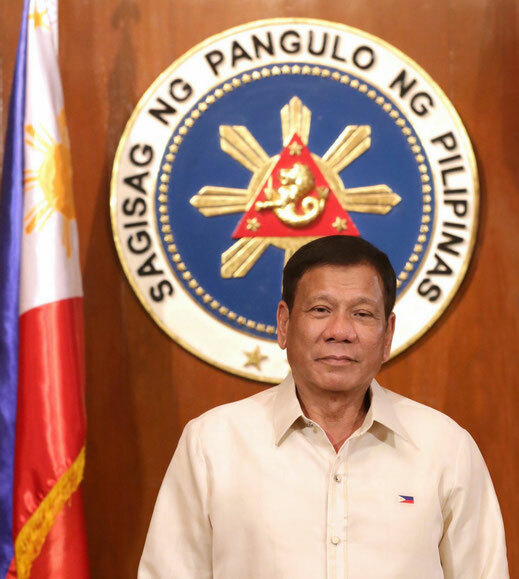 Republic of the Philippines Ambassador to the U.A.E. This year marks the 95th year of the establishment of the accountancy profession in the Philippines. Accounting was legally recognized as a profession on the 17th of March 1923 with W. W. Larkin as the first Board of Accountancy Chairman and Domingo Dikit and Felix Tiongson as members. A lot has changed in the world of accounting since then, from tedious manual worksheets and financial reports, it evolved to automated financial reporting. We can now perform our tasks in an instant, anywhere in the world. Advancement in technology enabled us to perform our tasks more efficiently and effectively. Today, accounting standards, local and international regulations have become firmer and competition became fiercer. New standards and updates are being implemented annually in addition to new local laws affecting us, such as the implementation of Excise and Value added tax in the UAE. The implementation of the new requirement for 120 units of continuing professional development is a testament of how times have changed and how we should cope to these advancements. With the implementation of ASEAN MRA, soon, we can also apply to become ASEAN Chartered Financial Accountants (ACPA) and be recognized across Southeast Asia. International Certificates are now more easily accessible such as US Certified Management Accountant (CMA), US Certified Public Accountant, Chartered Financial Accountant (CFA), Certified Internal Auditor (CIA) and others. With these changes, we, the Filipino accountants have evolved as well and should continuously adapt to the changes to come. We should start the change in ourselves and not be complacent. It is not acceptable to think that if we already have a good job, it will stay the same even without improvement. If we just stay put, we might wake up one day that we are already left behind. It is time to awaken and increase our competencies, increase our worth and build our name. This year, the theme of PICPA is “Promoting INTEGRITY. Advancing EXCELLENCE.” Aristotle once said, “We are what we repeatedly do. Excellence, then, is not an act, but a habit.” We can learn how to be excellent by doing an act repeatedly over and over but we must always bear in mind that in everything we do, we have to maintain our integrity and credibility. We may not gain all the material things the world can offer, but through our integrity and service to others, we can give other people a glimpse of who we are and leave a mark, no matter how small to this world. I have had a lot of challenges through the years, personally and professionally, and never did I imagine that one day, I would become where I am now and even become a president of the Philippine Institute of Certified Public Accountants (PICPA) - Abu Dhabi Chapter. I am a cancer survivor, yes, I AM. That in itself for me, is already a big achievement, but this position has been handed to me by God and our members. At first, I was hesitant to accept the position as I know how big the responsibilities are for being one, but, through the encouragement and trust of my fellow officers, I believed in myself and accepted this challenge. Without them, I will never be able to do this. 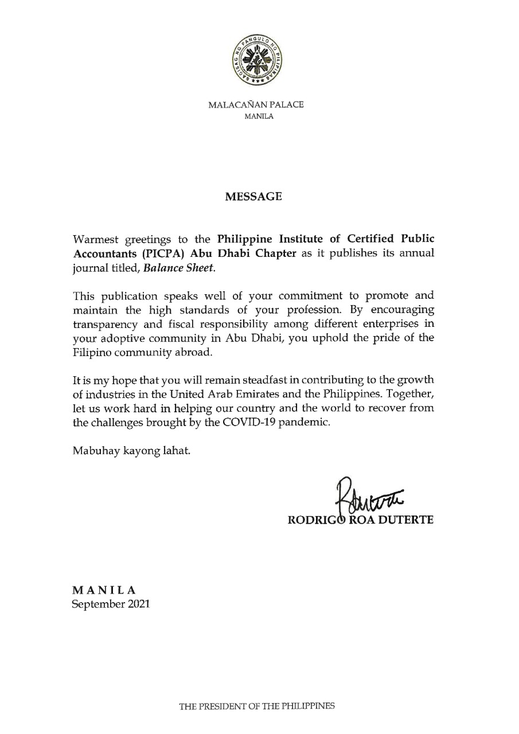 Together with our hardworking volunteer officers, who never hesitate to share their time and even resources, in the service of the profession, the organization and its members, we will do our best to promote and uphold the high standards of the accountancy profession and serve the interest of the members while also contributing to the Filipino community in the UAE. Our challenge to you, our members, is to actively participate and support our activities and together, we will achieve and maintain our competitiveness, not just here in the UAE, but globally. Through PICPA, you can earn the required CPD units to renew your licenses. Through PICPA, you can volunteer and mentor aspiring Certified Public Accountants reach their dream ad get their license. Through PICPA, you can meet your fellow accountants and have a second family here in the UAE. I came to PICPA to have a social life and meet new friends and I gained a FAMILY.